We got a bus to thew town and checked into a hostel called Pak Up. The dorm was nice and spacious all female. The hostel was in a good location to everything. We walked around and planned the next few days. We took a long tail boat trip on the river for 2 hours. We went through the mangroves and to a local fish farm saw puffer fish, red snapper then had a lovely meal on the river. The next day we booked to go to the hot springs. It was a natural outdoor one. So amazing and warm. You had to climb into the rocks and the pools and after into the cool lake. Really nice. 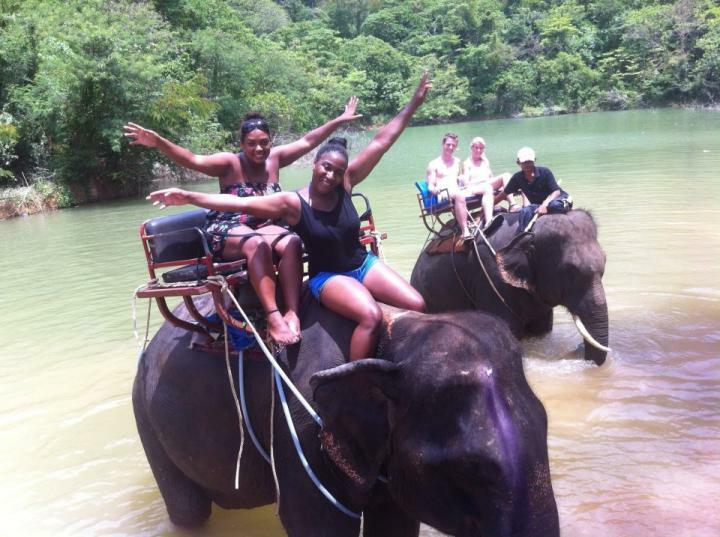 They then took us to go on an elephant trek in a small jungle type place. I didnt like the way they hit the elephants anjd shouted at them though. But it was nice being with the elephants and went into water with them while they had a drink and washed. We saw a mother elephant washing the baby one and it was rolling around in the water. So cute. That night we went to a local reggae bar. There was a live band they all had dreadlocks, smoked weed and thought they were Bob marley haha. really good night, good music and we met alot of people from our hostel there aswell and had a few drinks with them. We saw a ladyboy flirting with an american man while his fiance was there with him. Crazy! Had a good night but time to move on to the next island.